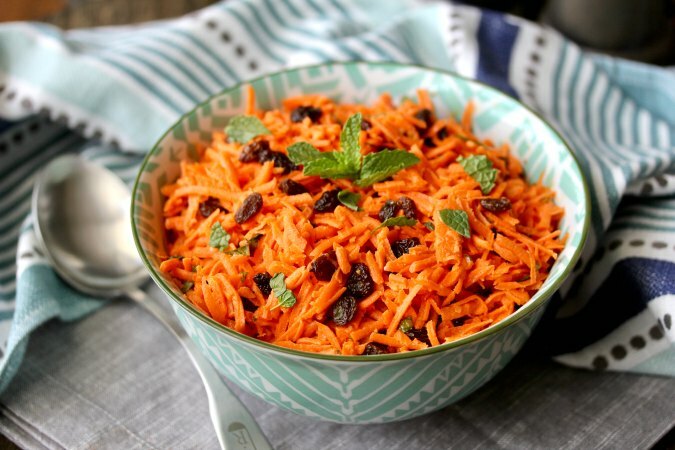 Carrot and Raisin Slaw with Cumin Yogurt Dressing, including garlic, coriander, and mint. 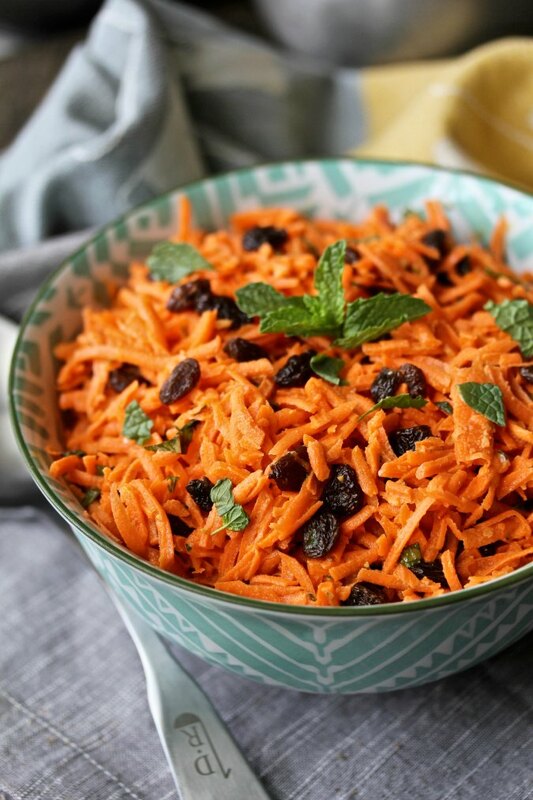 This shredded carrot and raisin salad is light and savory. It's not the sweet carrot and pineapple salad you might remember from PTA potlucks. Instead, it's a crunchy slaw flavored with ground cumin, ground coriander, and shredded mint. What's also great about this carrot salad is that you can make it in advance and it stays fresh. It even makes great leftovers. 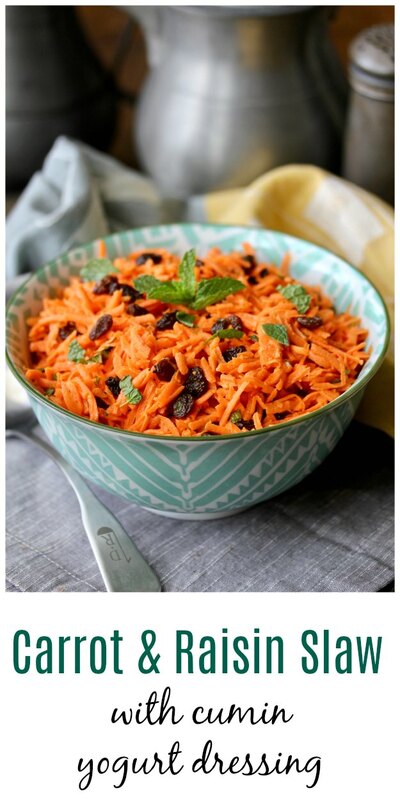 I love the combination of the herbs and spices in this carrot and raisin salad. There's even a little garlic in the dressing to make it even more interesting. Plus, the color! I used my food processor to shred the 1 1/2 pounds of carrots, which took less than five minutes. This recipe has been slightly adapted from the book Mark Bittman's Kitchen Matrix: More than 700 Simple Recipes and Techniques to Mix and Match for Endless Possibilities. Over 700 recipes in 300 pages! This recipe came from the section, Slaw +8 Ways. There are recipes for slaw with kohlrabi, Brussels sprouts, daikon radish, broccoli, fennel and celery, beet, and even a cabbage slaw with barbecue sauce. I'm spending a year cooking through sections of the book with Wendy of A Day in the Life on The Farm and Camilla of Culinary Adventures with Camilla. Keep an eye out every Tuesday for our weekly posts. After the recipe, be sure to check out the slaws that Wendy and Camilla made. Whisk together the yogurt, olive oil, lemon juice, garlic, cumin, and coriander. Toss the dressing with the carrots, raisins, and mint. This sounds amazing. I don't know what I would do without my food processor. Ditto. It's been a workhorse. I wish I had more room to just leave it on the kitchen counter. I probably wouldn't have bought it except it was fun to join Cam and Wendy. Now that I have it, I'm really enjoying it. Sally, we'd love to have you join us if you are inclined!! This reminds me of a favorite salad my mom used to make. I'll definitely give it a try. Thanks. Thanks! The cumin makes it so interesting!